Taiwan's parliamentary speaker scored another victory in the battle for his job Monday after the high court upheld a ruling against his party's decision to expel him over claims of influence-peddling. Earlier this month, the Taipei district court granted Wang Jin-pyng's request for a provisional injunction against the Kuomintang (KMT) party, allowing him to hold his party membership and therefore continue as speaker. The party, led by President Ma Ying-jeou, appealed the ruling, but the appeal was thrown out by the high court on Monday. [Presidential spokesman] Lee stated that President Ma Ying-jeou’s insistence on the independence of the judiciary would never change, nor would the President tolerate the fact that the Legislative Speaker had illegally lobbied the Justice Minister and the chief prosecutor of Taiwan Provincial Prosecutors Office in a court case involving the DPP party whip Ker Chien-ming (柯建銘). Lee stated that there was no gray area in the Wang case. What will President Ma do if the Supremes don't uphold this political assault on the KMT's own Speaker? Even more deliciously, the Justice Ministry announced a probe of SID chief Huang, a probe which Ma had to make pro forma noises saying he supported. The SID explains all its wiretapping here. Just accidents and mistakes. Ma's approval rating had hit a record low of around 9 per cent earlier this year, before rising to more than 21 per cent in a recent poll. I guess two weeks ago is "earlier this year." Technically. The protest against Ma was variously reported: "tens of thousands" in Taipei Times, 5500 in WSJ (police estimates). 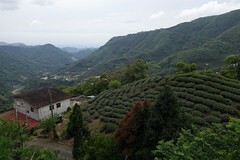 Tea being picked on the 169 on the flanks of Alishan. Ma, accompanied by Minister of the Interior Lee Hong-yuan (李鴻源), Secretary-General of the Executive Yuan Chen Wei-jen (陳威仁) and Minister of the Education Chiang Wei-ning (蔣偉寧), paid his respects to the Chinese philosopher by burning incense and watching a bayi (八佾) dance. The dance, a ritual traditionally acted out to pay respect to emperors, was performed by 64 students. The temple also opened the Lingxing Gate, its main entrance which is usually closed during the ceremony, and arranged for the president to enter the temple via the route traditionally taken by emperors. Addressing the ceremony after the two-hour ritual, Ma cited the Analects to emphasize the importance of politicians taking a righteous path and said the wisdom in the Analects has been a reference when he was making cross-strait policies. “The Analects discussed how feudal barons interacted with each other and how they handled politics. I’ve taken the wisdom of the Analects as a reference in my cross-strait policies,” he said. Note how deeply ideological such an appearance is, and how inflated. By mentioning his cross-strait policies, he reinforces his own Chineseness, and locates his political action with Beijing in that context, as if to say we might disagree, but China endures. One must also ask whether it is appropriate for the president of a democratic society to receive the honors of an imperial authoritarian. I can't help feeling that these behaviors are the actions of a man who is deeply and ideologically rigid and further, totally out of touch with the domestic political situation. Taiwan's democracy should not be marred by illegal eavesdropping, arbitrary justice, and political interference in the media or electoral institutions. As I said then, just take that speech as a 180 degree reversed road map about what is actually going to happen. Reviewed: The Man with the Compound Eyes. My friend the NH Bushman's car is clipped by a bus. He videos the driver tossing the mirror angrily. HTC takes beating in sales. Acer also, sadly. Taiwan's branding woes continue. 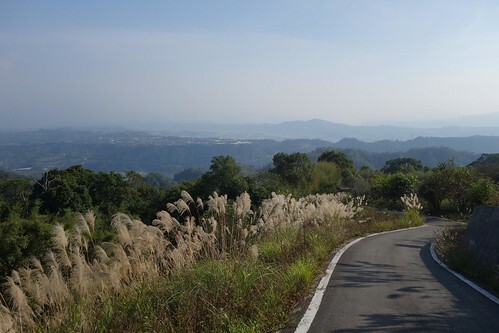 Taichung remains preferred city to live in for Taiwanese. China decides to let Taiwan take part in ICAO, says Businessweek. 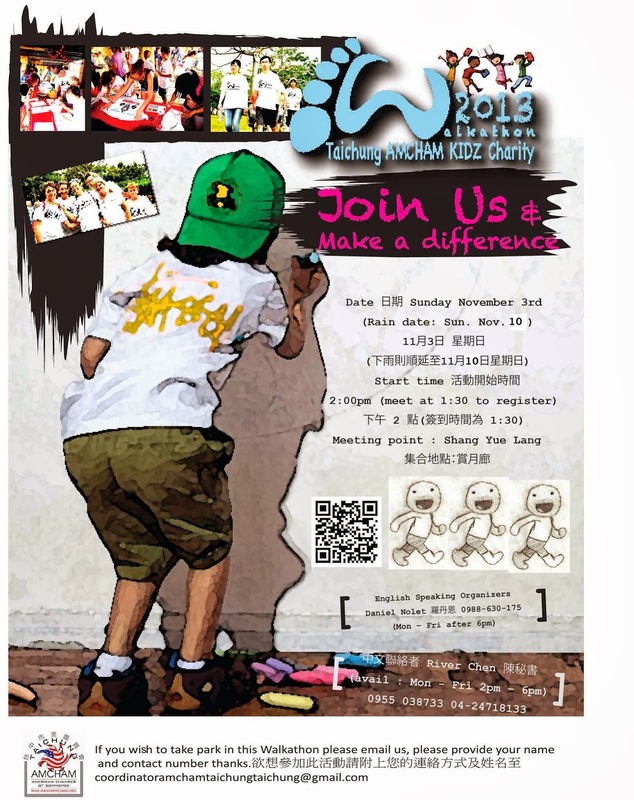 Taiwan Today on the culture of cute in Taiwan. Earlier in the day Legislator Ker Chien-ming, a caucus whip of the opposition Democratic Progressive Party (DPP), told the press he had received notice from the court that the wiretapping of his phones had been discontinued, following his acquittal in a breach of trust case. The notice listed several numbers that had been under surveillance, including his cell phone number and the Legislative Yuan's switchboard number 0972630235, Ker said. "Even the parliament was being monitored," Ker said at a press conference at the Legislative Yuan, which was also attended by DPP legislators Wu Ping-jui and Kuan Bi-ling. Meanwhile, at a separate press conference Saturday morning, acting SID spokesman Yang Jung-chung repeatedly denied Ker's accusation, which was reported in a morning newspaper. The SID "has never eavesdropped on the switchboard of the Legislative Yuan," Yang said several times. He said 0972630235 is the number of a cell phone used by an individual. However, Tsai Wei-min, head of the Legislative Yuan's General Affairs Department, told the press the same day that the number has been used by the Legislative Yuan since August 2006 as part of a cost saving system. Readers may recall that Legislative Speaker Wang Jin-pyng had been publicly accused by the President of influence peddling by calling the Minister of Justice and having him tell the prosecutors not to appeal a not guilty verdict against Ker. The DPP politicians also said that the SID had been monitoring the prosecutor in the Ker case, which the SID admitted. They admitted that they monitored her 12 year old daughter, accidentally, since she was using her mom's phone (SCMP). They then switched to the husband's phone which Lin Hsiu-tao was using, musical phones being a common feature of busy families. It is striking that no transcript of the alleged phone calls telling the prosecutor to lay off Ker has been produced by the SID, since it has leaked transcripts of Wang Jin-pyng's phone calls. Indeed, the lack of such leaks suggests that no such transcripts exist. This tends to support Wang's claims that he was just comforting Ker and hadn't done anything. Asking the KMT to consider a settlement is tantamount to advising the party to "compromise its insistence upon resisting influence peddling in judicial cases and upon defending the core values of democracy and rule of law, which is an independent judiciary," the statement said. Events like this are reminders of how the KMT continues to imagine the State is an appendage of the KMT Party, using the diplomatic corps to comment on and defend what should be an internal matter of the KMT and a domestic politic issue. Note that if they had merely said nothing, or confined themselves to noting in a pro forma fashion how the open political conflict is an indicator of the strength of Taiwan's democracy, they would not now be having to apologize..... this affair continues to be a needless mess entirely the creation of Ma's KMT.... and judging from the comments on Facebook, tomorrow's news will be even funnier. ADDITIONAL REFS: Jens Kastner with some sensible quotes from John Copper on the MaWangMess. Taiwan receives aircraft, holds live fire exercise. Japanese auto parts firms indicted for price fixing, Taiwan may be involved. Taiwan also involved in honey laundering. That's old news. Trinidad woman needs $40K to come to Taiwan to find missing daughter. According to government statistics, the disposable annual income of people aged below 30 averaged only NT$366,000 (US$12,388) in 2012, lower than NT$380,000 in 1999. In 2012, the starting monthly salaries for bachelor's degree holders averaged NT$26,000, down from NT$28,000 in 1999. The average starting salary of master's degree holders was NT$31,000, up only slightly from 13 years ago, when the average salary was NT$30,000. There is an obvious trend in which wealth is concentrated in the hands of the older generations. In 2010, 75 percent of residential properties in Taiwan were owned by people aged 45 or older, with homeowners younger than 35 accounting for only 8 percent. Many of these young homeowners are believed to have obtained financial support from their parents. In other words, the situation for young people is even worse than it appears. Premier Jiang Yi-huah (江宜樺) yesterday decided that beginning next year, the minimum wage will be contingent on growth in the consumer price index (CPI), a policy drawing severe criticism from labor groups. With a threshold of a cumulative CPI growth of 3 percent or higher needed before the minimum wage will be reviewed, “it is highly likely that the basic wage levels will remain stagnant in the remaining three years of President Ma Ying-jeou (馬英九) tenure,” Taiwan Labor Front secretary-general Son Yu-lian (孫友聯) said. 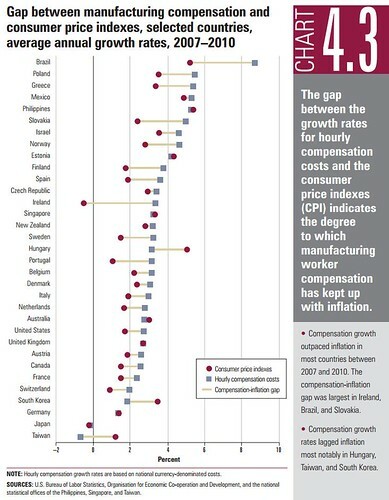 This means that the government can hold wages down without appearing to, simply by lowballing the CPI. Theoretically, wages will always remain the same relative to prices, which means that laborers will never be able to capture a larger share of the pie, at least while the Ma government is in office. 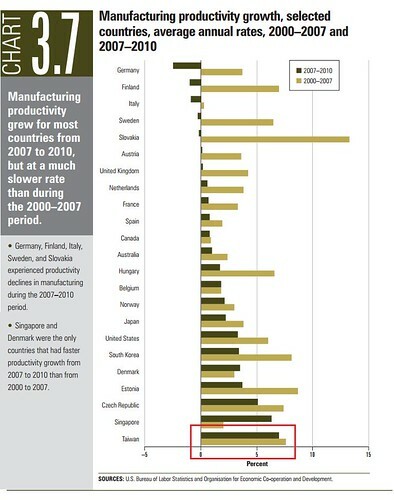 Since 2007 and especially since the Ma Administration came to power, wages have regressed while productivity has boomed. 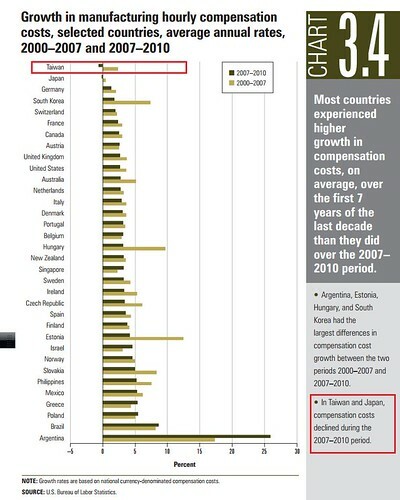 Taiwan's gap between CPI changes and wage changes was the highest in the world in 2010. The Ma government wants to freeze this historically anomalous situation and treat it as the norm. The struggle for control of Taiwan between the pro-China and pro-Taiwan sides really masks the brutal and ongoing defeat of Taiwanese workers economically; it enables both parties to enlist workers on their side via their tribal social identities while screwing them out of their rightful livelihood. Taiwan should reform its economy to prosper. The Writing Baron on the old Beitou Granary. 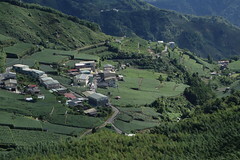 Such sites are found all over Taiwan. Halpin says the MaWangMess is nothing like Watergate. Tourists from India to Taiwan on the rise. China's Xi touring Central Asia, where it is a huge investor and power player. China is the major victor of America's defeats in Iraq and Afghanistan. Its influence in the area is unmatched. Off the Beaten Track on the Lost Soul Valley, now buried under a massive landslide, and an abandoned amusement park. Surely this tiny island has more abandoned amusement parks per square kilometer than any similar sized region on earth. China sending out more jets to play games with Japan over the Senkakus. The South China Sea festers while the US wastes treasure and effort and diplomatic credit in Syria. Taipower on a WWII US attack on central Formosa. Wasserman: Mankind must focus efforts on Fukushima. Oz rips Taiwan's clerics for being homophobic nutjobs. 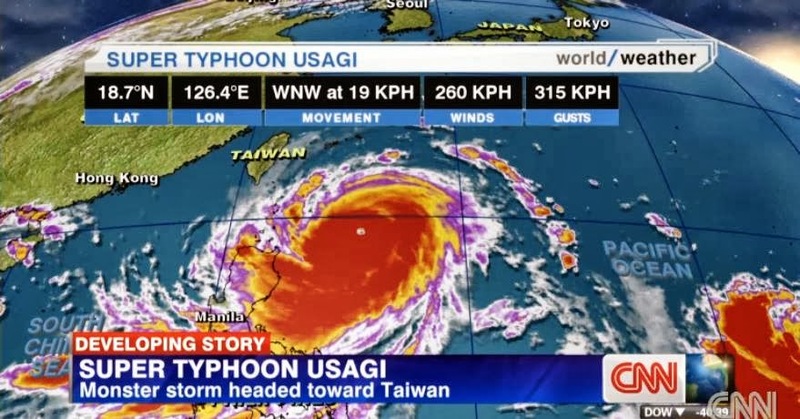 Now upgraded to the year's biggest typhoon. Oh boy. The South is going to get slammed. PEKING - China told U.S. Secretary of State George Shultz yesterday that the Reagan Administration would sabotage Sino-U.S. relations if it bowed to pressure from Washington's Taiwan lobby. The official People's Daily newspaper accused Mr. Shultz of contradicting himself during his Senate confirmation hearings last week, quoting him as saying that the United States never formally recognized Chinese sovereignty over Taiwan, but as acknowledging at the same time that there was only one China. ....The judges have been around a little longer and are less idealistic and more political. This is probably a selection effect, with the politically reliable ones getting promoted. The higher up the court system you go, the more political the court supposedly is. So it isn’t surprising that Ma lost in the lower court. Experience tells us that the higher courts will be more sympathetic to his arguments. Today, right on cue, High Court judges were randomly assigned to the case. Wang had asked for a public lottery, but the court insisted on doing it through a random computer process. Magically, the lead judge is married to a senior KMT figure who actually ran for the legislature under the KMT banner many years ago. The talk shows are abuzz questioning whether the assignment was really random. Couple of things I'd like to note. First, I think Froze is correct in noting higher court judges are more ideological/political -- a lot of them are older civil servants from the 1980s when entrants into the bureaucracy were vetted to make sure they have properly pro-KMT political views. So the whole system appears biased, and it will take two generations for any such bias to work itself out of the System. I also think the lower court realized its ruling didn't matter, since whatever it said would be appealed. So the Court decided to have a little fun and then kick the case upstairs for its true resolution. Another issue here is Wang's request for a public lottery for the judge selection. That's pretty much an admission that he strongly suspects the computer system is rigged. 2016 now looms. Wang will be 75 and too old to be a candidate. Wu Den-yi, the Vice President, is not a congenial figure. Hau Long-bin, the mayor of Taipei, got elected in a city where they'd vote for the dead, rotting carcass of a dog on a stick if it were the KMT candidate. By reporting to the president and then releasing the transcript at a press conference — without laying any charges — the SID grossly violated laws requiring nondisclosure of its investigations and has confirmed suspicions that it is a political tool of the KMT. There are also questions about the legality and propriety of the wiretap. These actions constituted (to use his words) “improper influence at the highest level,” abuse of the office of president and violation of the separation of powers fundamental to a democracy. Ma then acted in his capacity as KMT chairman to have Wang’s party membership suspended and remove him as a legislator-at-large. This confusion of Ma’s two roles as president and party chairman looks like a return to the old party-state practices of the KMT. Third, contempt of the legislature. By using an internal KMT party process to remove its speaker, Ma has seriously violated the rights of the legislature. The speaker of the legislature is elected by its members. The legislature oversees the president. Now Ma has used his power as party chairman to become the overseer of the legislature. This has serious implications for KMT proportional vote legislators who must worry about a party chairman who can remove them so easily. A vast crisis, now in suspension while the Court rules on it. All of it triggered by Ma's own actions, which he did not have to take. WSJ with a strong round up of the MaWangMess. Haha. Suddenly the US can't afford to sell Taiwan F-16s. And so the merry-go-round continues. Nobody wants Taiwan to have F-16s except the DPP government. Taiwan seizes 820 kilograms of dolphin meat. Dolphin meat is always available if you know where to ask. Dapu: Miaoli County Chief confronted by protesters. The police parted the crowd for him and let him in to pay his respects to Mr. Chang. However, when protest leaders stopped by the home to visit the body, the police would not let them in. Taiwan dry bulk shipping firms to get boost from China trade. We are pleased to let you know that the new issue of Taiwan Communiqué is hot off the press (attached). This issue starts with a summary and analysis of the recent developments under the heading Taiwan’s Watergate, focusing on President Ma’s attempt to oust Legislative Speaker Wang Jin-pyng. When the Taipei District Court handed down its ruling last Friday, Ma’s lawyer made an interesting comment to the press. In his disappointment with the news, he turned to the reporters and said something to the effect of, “I hope no one ever says the courts are run by the KMT again.” This was a reference to an infamous statement from about 20 years ago. Hsu Li-teh 徐立德, who was then Vice-Premier, Hsu Shui-teh 許水德, who was then KMT Secretary-General, told KMT members not to worry about the legal consequences of their actions because, after all, “the courts are run by the KMT 法院是國民黨開的。” The courts have done little to dispel this notion over the past 20 years. Again and again, KMT members seem to acquitted or given very light sentences while DPP members seem to get the harshest treatment possible under the law. The whole post is excellent, don't miss it. I first met Chang Sen-wen (張森文) in front of the Executive Yuan on July 3. It was an excruciatingly hot day. He was in a blue shirt, wearing a straw hat, underneath a tent that had temporarily been erected in front of the EY. Next to him, his wife, Peng Hsiu-chun (彭秀春), was giving interviews to reporters, making her case, as she had done dozens of times over the past three years, against the efforts by the Miaoli County Government to demolish their home and the small pharmacy they operated to widen an intersection on the way to a science park project. Wow. The bottom map... Yes, in modern maps, north is at the top. 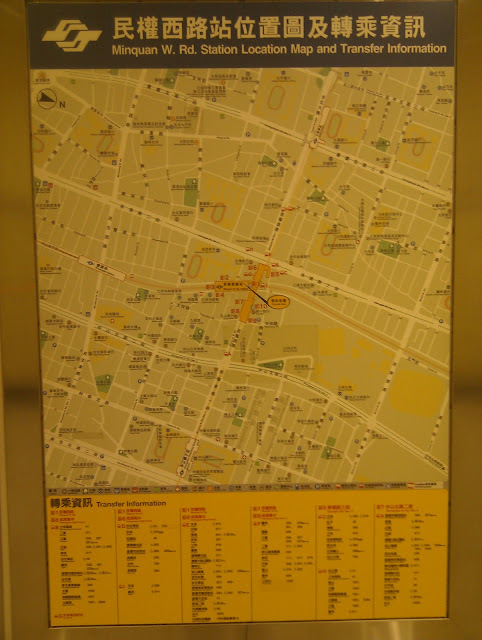 In traditional Chinese maps, south is at the top. 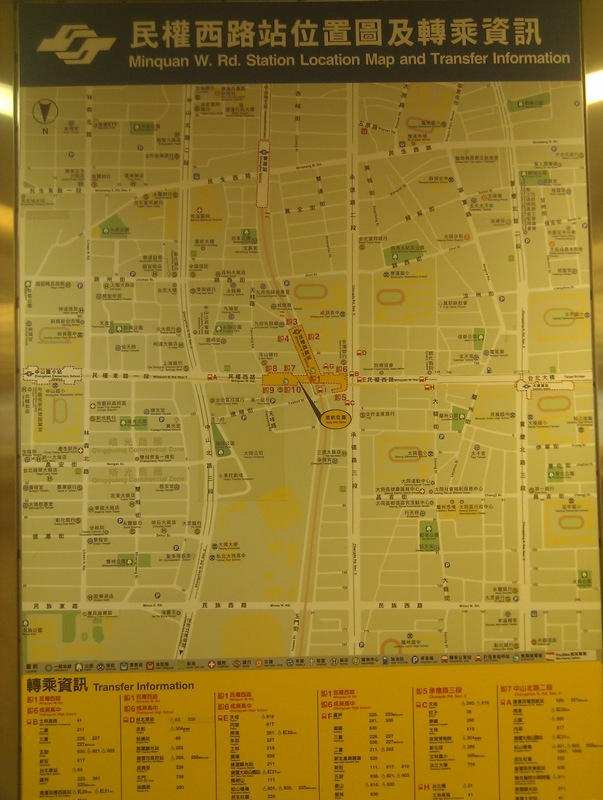 But Minquan W Rd station is a whole new orientation. UPDATE: Great comments below explain what is going on. Apple Daily has had some wonderful front page illustrations during this Ma-Wang disaster. Let's remember -- this affray is entirely the result of Ma's decisions. Nothing called for him to do anything but make his usual noises about resolving things by the law, the KMT is clean, he is against corruption, etc. He didn't have to go after Wang and spark a political and possibly even constitutional. This crisis is entirely of Ma's making. I detect several pro-China spins in this report, including the subtle assumption that Taiwan Speaker Wang Jin-pyng, DPP Legislative Whip Ker and Justice Minister Tseng really are guilty of something. These are political figures that Beijing doesn't trust and would gleefully discredit. And when a Taiwan official tells a WPost reporter calling from Beijing "it's unsafe to talk, we're being monitored," he is probably referring to the Chinese security services' routine monitoring of Foreign Correspondents' telephone calls as much as anything else. The article even terms the feeling of being watched "paranoia" though the piece is about -- what kind of case? Yes, a case in which the government wiretaps were used to discredit the President's perceived political enemies. The news report for more than 30 scholars and law professors signing a document saying Ma has crossed a constitutional red line is here. I've placed the text under the READ MORE divider below. Thanks to Ketty Chen for sending it around Facebook. The Constitutionality of Ma's acts is starting to loom; what looked like Ma simply doing something fantastically stupid is slowly blowing up into a constitutional crisis. Civic groups pointed out that by listening to the prosecutor and removing Wang from his position in the legislature, Ma may have committed a constitutional violation. The Taipei District Court yesterday ruled in favor of Legislative Speaker Wang Jin-pyng’s (王金平) provisional injunction seeking to retain his Chinese Nationalist Party (KMT) membership and position as head of the legislature. The court ruled that Wang would be able to retain his membership and rights as a KMT member after submitting a guarantee of about NT$9.38 million (US$314,300), Taipei District Court spokesperson Lai Chien-yi (賴劍毅) told reporters. The KMT plans to appeal, so stay tuned. FocusTW explains the Court's logic. The panel of three judges granted Wang's request on the basis of avoiding "irreparable damages" that the plaintiff would suffer due to a loss of eligibility to serve in the Legislature while waiting for a court to rule on his other lawsuit. Motives? Lots of people are pointing to simple hate. Lee Yuan-tseh, Taiwan's nobel prize-winning physicist, criticized Ma for constantly having his features distorted by hate. Nathan Batto over at the awesome Frozen Garlic has a marvelously informative blog post on the whole affair, well worth reading. He is leery of identifying a motive. All politics may be local in some places, but in East Asian Confucian societies, all politics is personal. I'm with the vendetta believers, though I am sure the politics of the moment, and of the future (particularly Ma's prized cross-strait peace plan) may have played a role. I don't think Ma is playing 11-dimensional chess or is all that impatient with what's going on in the legislature; I think he seized a chance to revenge himself on someone he really just totally hated. Like a sort of inept, out of control Michael Corleone, he's taking revenge on everyone who offended him by opposing him: the jailing of Chen Shui-bian, the investigation of Lee Teng-hui for embezzling (handled by the same prosecutor who went after Wang in this case), the investigation of Su Tseng-chang for his handling of government papers, the attack on Wang, the prosecutions of DPP politicians all over the island, etc etc etc. The China Times says Ma sacrifices Taiwan's Future by Slaying Wang. 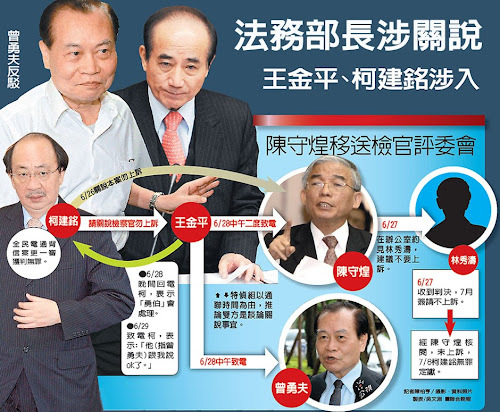 The China Times also pointed out that Lin Yi-shih, the Ma associate who was recently given six years for corruption, is still a KMT party member. Jonathon Manthorpe, longtime observer of things here, has a write-up of events here. Lighter moment: some delegation went to Washington to complain to people there about Taiwan's Watergate -- illegal wiretapping! Bwahahaha. Don't they read the news? Complaining to Washington about someone engaged in illegal wiretapping is like complaining to the Mafia about what horrors illegal prostitution and gambling are. Taiwan military delays volunteer service by two more years. Rex How analyzes the reasons Ma wanted a debate with the DPP over the services pact. One tactic the KMT uses is to reduce all conflicts over X to a partisan conflict between the pro-China and pro-Taiwan forces. Taiwan looks to poach Malaysian students to offset China brain drain . James checks his pics. Not a great day for pics; by the time we got up high, the rain and fog was rolling in. Moral of the story: you can never start too early in the mountains. Yet it was still a surpassingly lovely ride. 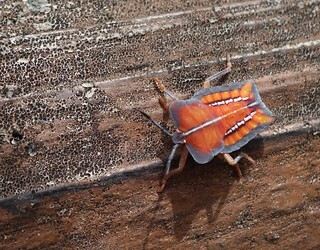 Went out this week and hunted bugs with one of my students who also has a nice macro lens. "I have no choice but to take a stand,” Ma Ying-jeou on Wang. The news that President Ma Ying-jeou has decided to deep six the Speaker of the Legislature Wang Jin-pyng, a longtime rival within the Party, has reverberated across Taiwan and abroad like the thunder of a landslide in an empty valley. Basically, if I had a nickel for every email in my inbox containing the keywords "Ma Ying-jeou", "Wang Jin-pyng", and "WTF", I'd be a very rich man. First, the fracas has now reached the international media. AP recovered from its pointless bog-standard hack on Chen Shui-bian (C'mon guys, that is so 2008) the other day to produce a more in-depth view of the issues. However, Wang has not been suspended as the article says. This appears to be an error. His membership has been revoked, but he can apply to re-enter the KMT in two years. A suspension would have permitted him to retain his speakership and position in the legislature, revocation automatically removes him from the at-large legislator position and attendant power and privileges. This FocusTw piece discusses that. Bloomberg also discusses the case and notes that the Taiwan dollar has plummeted thanks to Ma Ying-jeou's weird obsessive stalker attack on Wang Jin-pyng. Ma was so driven to get Wang that he remained in his office to follow the KMT committee vote and canceled a meeting with the President of El Salvador, sending the Veep instead (TT full report). Ma's talk as Chairman is summarized by the KMT news organ here. Ma, who had been calling for Wang's removal since last week, shed tears when asked by committee members why he was insisting that Wang must go. "Though it is a painful decision, it should still be made," Ma said at a news conference. [Wang]The veteran politician enjoys broad support in the legislature and throughout southern Taiwan. Although he had no direct evidence of the alleged irregularity, Ma denounced Wang on Sunday for what he described as the "most serious infringement of Taiwan's judicial independence" and the "most shameful day in the development of Taiwan's democracy". The way Ma dealt with the case without due process of law and his subjective conclusion has seen Wang gain overwhelming support and sympathy from the public and news media. Mr. Tseng is among a list of officials that have fallen from grace since Mr. Ma was elected president in 2008. Last month, Taiwan was forced to name its second new defense minister in a week, following the resignation of newly installed ministry head Andrew Yang after he admitted plagiarism. Mr. Ma also lost his finance minister two weeks into his second term last year and watched his cabinet secretary get hauled away in handcuffs in December amid allegations of bribery. In addition to the withdrawal of referendum legislation for the 4th nuclear plant, the DPP also withdrew from the Ma-Su debate on the cross-strait service agreement. The fierce debate in yesterday’s CEDC meeting lasted 2 hours and 30 minutes. However, in the end, all 11 committee members present were overwhelmingly in favor of revoking Wang’s party membership. Two other members were absent. Yesterday afternoon, the KMT immediately sent the certification that Wang Jin-pyng had lost his party membership to the Central Election Commission, confirming that Wang had lost his qualification as a KMT legislator-at-large elected on the party list. The KMT Party Charter stipulates, “An appeal of a party member shall not affect the validity of a decision handed down by the Central Evaluation and Discipline Committee.” In other words, if Wang wanted to keep his party membership, he had to petition a court of justice to grant a preliminary injunction before the KMT notified the Central Election Commission of its decision. However, the Central Election Commission yesterday had already received the notification from the KMT to delete Wang’s name from the list of at-large legislators elected on the party list. Since the KMT already sent its decision to revoke Wang’s party membership before any court could hand down a ruling, Wang’s petition for a preliminary injunction had no statutory “necessity.” Therefore, his petition would be turned down by the court, and the fact that Wang would lose his seat as a legislator-at-large and consequently the Speakership is a foregone conclusion. Wang has elected to sue but it is hard to see what the grounds would be. Although in my personal experience of institutional rule making and implementation in Taiwan, the rules are so complicated and contradictory that it is likely there will be problems with almost any serious action taken by an institution in Taiwan. The pro-Green Taiwan Thinktank has some poll data. Ma's satisfaction hit 10%, dissatisfaction is stable at just over 70%, a number seen in many polls. Wang's scores, respectively, are 60% and 22%. Over half of those polled feel the Special Investigations Division is not impartial. TVBS poll data from earlier in the affair is here. A commentary in the Taipei Times relentlessly criticized the SID for its suspiciously political handling of the case. Although a small number of low level local politicians resigned from the KMT in protest, Wang has called for party unity and asked members not to withdraw from the KMT. This is a very clever move -- it makes Ma look like he's the one violating party unity. It's not difficult to see where this is heading. Ma is going to continue to take a pounding in the polls and in the hearts of the public. Disgust with him is widespread. Moreover, because Taiwanese identify with Wang as a southerner and a Taiwanese, this attack is going to have a powerful ethnic resonance -- just another victimization of the Taiwanese by the KMT. Heads will nod all over Taiwan. Wang now faces a range of choices for revenge. With mayoral and local elections in 2014 and presidential elections in 2016, Wang could run with the DPP. Or run as an independent and hand Taipei or Taichung to the DPP. The problem is that a year from now he will be old news -- look at Soong's laughable runs for mayor in Taipei and for President. Three years from now, in the 2016 Presidential election, Wang will be ancient history, and ancient as well, at 75. John Copper in The National Interest on the Obama Administration's positively changing Taiwan policy. Fourth Nuclear Plant to get fuel rods. To hell with public opinion, says the government. East-West Institute with "new thinking" on arms sales. Here's the new thinking: "It proposes that the United States cap its annual arms deliveries (as opposed to announced sales) at a level that complies with the key stipulation of the U.S.-China Joint Communique of August 17, 1982, adjusted for inflation. It also calls on China to remove one of its five short-range missile brigades aimed at Taiwan and to dismantle the underlying infrastructure." Lessee -- how many thousand commentators have proposed an arms for missiles agreement or some variation thereof? Ralph Jennings in Forbes reports that Taiwan has ordered new corruption survey to reassure investors, who'd have to be pretty stupid to believe the Transparency International report in the first place. Any day I see a walking stick is a good day. A local journalist sent this around. They were applying to attend the ICAO. As another discussant observed, the newspaper this reporter represents is not affiliated with a Taiwanese new agency and thus there are no grounds whatsoever for rejection. With respect to your request for accreditation to attend the 38th Session of the ICAO Assembly, ICAO continues to conduct itself in accordance with the United Nations’ one-China policy and our unit is unfortunately not permitted to accredit media directly affiliated to Taiwanese news agencies while this policy remains in place. Wang booted from KMT. This means he lost his seat in the legislature and his Speaker position, since he is an at-large legislator serving at the party's pleasure. Ma vs. Wang: who will be eaten? Well...Ma Ying-jeou's hysterical attack on Legislator Wang Jin-pyng, with its condemnation of Wang as guilty of crimes he has not even been charged with, has blown up into an enormous political scandal with huge potential to damage the KMT and Ma Ying-jeou, all of it completely unnecessary, had Ma simply said nothing. It's also made it obvious that from the beginning this whole case was about getting Wang. Tseng's resignation was just the collateral damage. Wang had been in Malaysia attending his daughter's wedding when the news "broke" that the SID had tapes of him allegedly telling a DPP legislator that he had arranged for the prosecutors to forego an appeal in a not guilty verdict. The reason I use "broke" is because it looks like Wang took off and then as soon as he was out the door, the SID convened a press conference with the sensational claims about Wang and Ker and Justice Minister Tseng. What a coincidence, eh? Legislative Speaker Wang Jin-pyng on Tuesday denied having engaged in influence peddling, saying he "would absolutely not accept illegal accusations." Wang also accused the Special Investigation Division of violating the law and the Constitution by eavesdropping on the speaker of the Legislature and releasing a transcript of the wiretapped conversations. Flanked by supporters and fellow legislators at the airport, Wang delivered his first response to allegations that he lobbied the minister and the prosecutor in June on behalf of a fellow lawmaker who was the defendant in a breach-of-trust trial. Wang (here) also criticized the prosecutors for holding the press conference when he was out of the country (at his daughter's wedding, something sure to attract people's sympathy), saying that the Legislature must be respected and it is unacceptable for a small number of unscrupulous prosecutors to behave in such a manner. A day after President Ma Ying-jeou was accused of shaming Legislative Speaker Wang Jin-pyng in an influence peddling case, a presidential aide said Wednesday that it was Wang who showed no respect to the judicial system. "The moment Wang used his influence to call (Democratic Progressive Party lawmaker) Ker Chien-ming, (Justice Minister) Tseng Yung-fu and Chen Shou-huang (head of the Taiwan High Prosecutors Office), the justice system was shamed," said Lo Chih-chiang, deputy secretary-general of the Presidential Office. "It is not President Ma who has not shown Wang basic respect. It is Wang himself who has not accorded basic respect to the judicial system," Lo said. Note that the President has openly said that Wang is guilty. No weasel words there, no ambiguity. No presidential behavior either. It's total vindictiveness and hate, trial by media, and of course, it is widely perceived as using the prosecutors to settle political scores. Remind you of anything? Yeah, Ma's behavior in the Chen Shui-bian case. And also, all the other cases against DPP politicians under the Ma Administration. In fact, as a friend pointed out, in attacking Wang this way, Ma risks making the conviction of Chen Shui-bian look even more obviously political than it already does. Recall that Ma has many times cited a certain Asian city-state as a political and social model. You know, that Asian city-state where critics say that the one-party government deploys the judicial system against its opponents. Note that I am not saying that. I am just repeating what the critics say. I would never criticize that totally great Asian city-state. Note also Wang's legislative seat is a KMT party seat, an at-large seat and he was not elected by any district. Hence, his presence and position in the legislature are under the total control of the KMT. Ma as Chairman of the KMT has referred the matter to the disciplinary committee. If its internal disciplinary committee finds against him, he will be stripped of position and power (including, someone reminded me, his position as head of the Taiwan Democracy Foundation). Wang's case goes before the KMT disciplinary committee tomorrow, Wednesday. Honorary KMT Chairman for Life Lien Chan, the twice-failed Presidential candidate and KMT heavyweight supreme, criticized Ma for conducting the campaign against Wang. "It is inappropriate to criticize Wang Jin-pyng that way." Recall that in 2005 when Wang ran against Ma, Lien backed Wang. The crisis -- stoked entirely by Ma's relentless assault on Wang and referral of the case to the KMT's disciplinary committee -- is falling out along the old political lines of the right-wingers like Ma who are diehard pro-ROC ideologues, and the more flexible, inclusive, Taiwanese-centric KMT associated with Lee Teng-hui. UDN, the rabidly pro-KMT paper, came out for Ma. Gosh, do you think all the media yammerheads who wrote in 2008 what a pragmatic politician Ma is are going to write retractions? Nope. It will be fascinating to see what happens tomorrow. Longtime observers were saying that the Speaker position will likely go to Hung Hsiu-chu, who is the deputy speaker and who apparently is far more hawkish than the conciliatory, consensus building Wang, who is a master politician. Every year at this time, China aggresses in the Senkakus. This year ships and planes and drones. There was some speculation that Ma hisownself would go to APEC to hobnob directly with China's leaders but it will be Siew. 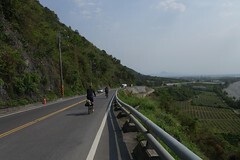 A turn on my favorite cycling route, from the 130 onto the Miaoli 49 to the Lungtung Broken RR Viaduct. Show up with a bike, I'll take you there. Politicians in the pan-blue camp yesterday expressed concern about the incident and urged the Ma administration to handle it carefully. Taipei Mayor Hau Lung-bin (郝龍斌) said the incident involves administrative, legislative and judicial issues, and such a constitutional matter should be addressed carefully. Former Taipei EasyCard Corp (悠遊卡公司) chairman Sean Lien (連勝文) expressed concern about the Special Investigation Division’s (SID) eavesdropping on Ker and Wang, but refrained from commenting further on the case. Lien’s father, former KMT chairman Lien Chan (連戰), also showed up at the Taipei City Council to cast his vote, but declined to comment on the incident. Meanwhile, conspiracy theories have been fueling the rumor mill, with KMT Legislator Liao Cheng-ching (廖正井) saying that he saw the incident as “sheer infighting” in the government’s judiciary system between Tseng and Prosecutor-General Huang Shih-ming (黃世銘), who led the SID, while others said it was an internal struggle in the Ma administration — infighting between Ma and Wang. The Democratic Progressive Party's (DPP) legislative caucus yesterday said that the Special Investigation Division's (SID) accusations against Justice Minister Tseng Yung-fu (曾勇夫) were designed to instigate infighting within the ruling party and the judicial system. Ma Ying-jeou said that after three days of consideration, he decided to publish this bitter statement. Ma stressed that Wang Jin-pyng's involvement in influence peddling cases with opposition politicians is a violation of judicial independence, which is a most serious thing, and is the most shameful day for the development of Taiwan's democracy and rule of law! If this is not seriously dealt with, Taiwan will sink into an infinite abyss. It's hard not to laugh at Ma saying things like this about Taiwan democracy. Essentially, the primary talent of politicians is strenuously denying that salt is salty one day and then indignantly affirming that it is the next. In that respect Ma is greatly skilled. The case offered another comical moment when the prosecutor in the Ker case, Lin Hsiou-tao, said that she had never said the words attributed to her, it was all the SID's doing, and she would never lie, because she is a Christian. LOL. On the serious side, she specifically said that her superior, Chen Shou-huang, who is supposed to have carried Minister Tseng's order to her not to appeal the not guilty verdict, told her to just do what the law says. Another Wang issue: stories are circulating that Ma wants to punish Wang Jin-pyng for insisting that the cross-strait services agreement be subjected to a review in the legislature, and because Wang has publicly criticized the Fourth Nuclear Plant, both pet projects of Ma. I seriously doubt this. Wang is always making noises that sound kinda mavericky. On ECFA he positioned himself as if he were resisting the President. Wang has consistently criticized the stupid legislative reform that handed control of the Legislature to the KMT. This is faux maverick behavior: Wang stakes out harmless "opposition" to things that are bound to occur, a favorite trick of "mavericky" politicians, giving them room to look independent while still safely remaining within the System. Wang also has an extensive network of connections to DPP legislators (as the Ker case makes plain) and they are always doing favors for each other. Ma must know that Wang has links in the opposition he must placate. Hence, it is more likely that if it is really true that Ma Ying-jeou is going after Wang Jin-pyng, it is because they are longtime rivals within the KMT and not because of Wang's stand on this or that piece of legislation. You had to love AP's report, which, in a six paragraph piece on the Tseng case, devoted three paragraphs to "analysis". One paragraph discussed how it would hurt the Ma government, and two paragraphs focused on the DPP -- one on how Ker's involvement would hurt the DPP and the other -- yes! -- recapitulating the really really really important fact that Chen Shui-bian was packed off to jail for corruption, which has absolutely nothing to do with the Tseng case. Wouldn't it have made more sense, if AP wanted to engage in actual reporting, that it would spend a paragraph reporting that local media were speculating that the case is the result of infighting within the KMT? After all these years watching the international media trying to report on affairs here, why am I still asking questions like that? SUPERPARANOIA: It's all a setup, see, to make Wang look like a victim of Ma to prime him for a presidential run in 2016. Taiwan's vapid, jingoistic response in the case of the Phils coast guard killing of a Taiwan fisherman is now reaping its first bitter fruit: Taiwan fisherman may be charged with illegal fishing in Phils waters. Steven Yates, one of the most intelligent commentators on Taiwan affairs (really should write more stuff, Steve! ), argues for closer cooperation between Taiwan and Japan. Ha! HTC is stock exchange's biggest loser so far for 2013. It's not surprising, when you consider that my HTC cellphone is so full of bloatware that I cannot uninstall that it no longer can upgrade. Needless to say, my next smartphone won't be HTC. Taiwan spends $400 million on grain, soybeans. Wedding photos can break out anywhere. Whoa, the Taipei Times reports on the recent developments. Prosecutor-General Huang Shih-ming (黃世銘) yesterday accused Minister of Justice Tseng Yung-fu (曾勇夫) and Taiwan High Prosecutors’ Office Head Prosecutor Chen Shou-huang (陳守煌) of illegally lobbying for a lawsuit involving Democratic Progressive Party Legislator Ker Chien-ming (柯建銘). Tseng announced his resignation later yesterday. A spokesman for the Supreme Prosecutors’ Office Special Investigation Division (SID), Yang Jung-tsung (楊榮宗), told a press conference earlier yesterday that after Ker on June 18 was found not guilty of embezzling funds from Formosa Telecom, he asked Legislative Speaker Wang Jin-pyng (王金平), a member of the Chinese Nationalist Party (KMT), to lobby Tseng and Chen to use their influence to stop a prosecutor from appealing the case with the Supreme Court. The piece goes on to say that Tseng and Chen are unlikely to face criminal charges because they didn't get any tangible rewards like kickbacks. You mean it's not a criminal act to use the power of your office in this way? Say what? Meanwhile the papers here are having a field day, interpreting events here as a power play within the KMT, a charge made by Ker, who said the whole thing is being orchestrated by President Ma Ying-jeou. Wang Jin-pyng, the KMT Speaker of the Legislature, a Taiwanese politician from Kaohsiung, and longtime Ma rival, was in Malaysia but was ordered to return to Taiwan by Ma (who is KMT Chairman). The Taipei Times reported on the allegations that the whole thing was a power play. Wang does not have a position within the KMT, but as legislative speaker and a key figure in the party’s localization factions, he has had great influence over the party. Wang also represents the KMT’s old power bloc, along with party heavyweights including former KMT chairman Lien Chan (連戰) and Wu Poh-hsiung (吳伯雄), and has had problematic relations with Ma in the wake of fierce competition over the KMT chairmanship in 2005. Wang's position is interesting. In the 2005 KMT chairmanship election Ma beat Wang on his strength among the party rank and file, while party elites all supported Wang. The "localization factions" remark points to Wang's position as the unofficial leader of the "southern legislators", a representative term for KMT legislators from south and central Taiwan (Wang is a southerner) who are often at odds with the party's mainlander elites in the bitter struggle over internal power and patronage network resource flows. The KMT has always attempting to suppress the growth of regional and national networks of local leaders, part of its divide-and-rule approach to controlling Taiwan. Given Wang's longstanding rivalry with Ma, and his position as an informal power broker, he makes a nifty target. No wonder the local papers are alive with speculation that Wang's downfall is the real goal of this investigation. Local reporters were saying that the SID sent around text messages to all the reporters -- not once, but twice -- to invite them to attend the press conference, saying there would be big news. The reporters all said that was rare. At the press conference the SID played the tapes for the reporters. The reader can draw their own conclusions about whether the SID was playing politics. Another issue deserves highlighting. There is the possibility that someone here may face criminal charges. Yet, as is so often the case in major criminal and political investigations, key evidence is being systematically leaked -- this case, the recordings of the conversations between Ker, Wang, and Tseng -- have been made public. This is trial by media, a feature of other political cases, such as those swirling about Chen Shui-bian. Think anyone in the SID will be reprimanded for this? Ha. Costa Rican cabdrivers prefer Taiwan to China. The US releases an updated version of the CRS report on the evolution of America's One China policy, which does not include Taiwan. The ROC gets all tetchy about it. Taiwan rocked and rolled to the news today that the Minister of Justice Tseng Yung-fu is going to be indicted by the SID, the special investigative unit. All day long Taiwan's multitude of news channels spoke as one, breathlessly discussing the case. The basic claim is this: Kerr Chien-ming, a DPP politico, was on trial for something or other involving someone or something. He was found not guilty. Investigators were tapping his phones in conjunction with another case being built against him, when they allegedly recorded him asking Wang Jin-pyng, the dapper KMT Speaker and man-about-legislature, to ask Tseng to intervene with the prosecutors and have them drop any bid to seek an appeal of the not guilty verdict. If you're interested, UDN has some details in Chinese. Tseng is already getting pressure to resign -- and is refusing (UPDATED: now has resigned) -- and is claiming that the head of the SID is pursuing a vendetta against him and making up charges. The two apparently dislike each other. There's just so much to savor about the awesomeness of the spectacle of the Minister of Justice claiming his own investigators are making up charges (cue Captain Renault) and the Ma Administration suffering another blow. President Ma even added bonus fun, intoning that "justice must never be politicized"
Stay tuned. This one will be endless fun. Wild East: Who Killed Shida? The campaign has been ongoing (here). This China Post tale from last year says local residents had organized a "self-help association" which made trouble for the local restaurants (here). Many of us had suspected the attack on the famed and beloved food and shopping mecca was orchestrated by land developers in cahoots with local government. Note again the pious yet selective application of the law which has become a common feature of so many of these cases. According to a city ordinance, restaurants are not allowed within a radius of 8 meters from residential buildings. “There are probably more than 10,000 restaurants located within a radius of 8 meters from residential buildings in the city,” a restaurateur, who spoke on condition of anonymity, complained. The move also seems to be a part of the "upgrading" that has swept away so many of Taipei's traditional markets and landmarks. Economics Minister Chang Chia-juch yesterday said Taiwan has the highest average electricity consumption per person in Asia and electricity prices are among the cheapest in the world. Household electricity prices are the second lowest in the world, while industrial electricity is the second cheapest in Asia and fourth in the world, Chang said. Such a price structure is hindering the government's efforts to reduce energy consumption and carbon emissions, but at the same time encouraging waste, he said during a radio interview, as he defended the economics ministry's decision to raise electricity prices in October. A breakdown of the fuel cost shows that over the past 10 years, oil costs have soared 29 percent, coal 168 percent and natural gas 100 percent, Chang said. Recall that the height of buildings is determined not by the value of the land and the land-owner's desires, but rather, by bureaucratic fiat. 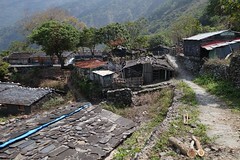 This means that in Taiwan, houses are smaller than they would otherwise be, since the bureaucracy is tightly linked to the construction-industrial state. The land thus has, essentially, a quota on the number of floors that can be built on it, and on the size of the building. Hence, the construction companies make profits larger than they otherwise would, even before consideration of all the corner cutting and misrepresenting ("but you told us there would be eight outlets in the living room"). Taipower finds itself trapped and immobilized. The Nuclear Power Plant No. 4 remains a hot potato. The liberalization of the energy industry and the promotion of green energy have fiascoes, like the proverbial blind men struggling to discern the shape of an elephant. Taiwan's political and business environment is deformed. Well-intentioned policies invariably attract unscrupulous politicians. State-owned enterprises have long transformed benefits into exclusive slush funds. As a result, Taipower losses have skyrocketed. Realistic constraints are vital. The cure must fit the disease. Rate hikes are better than nothing, but that is about all they are. If you read it carefully, it focuses on the revenue issue. How high do rate hikes have to go? It rightly recognizes that rate hikes aren't the answer. But the piece is still shot through with developmentalist-state mentality: not a word about conservation. This means that readers don't read about conservation, and don't think about it as a valid form of public policy. *reflect on this whenever you hear bureaucrats piously intoning how the government obeys the law. Indeed, whenever I hear officials say they are acting in accordance with the law, it is almost always the case that someone is getting the shaft.